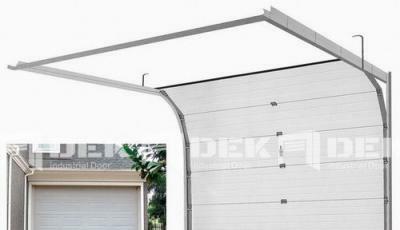 Industrial Sectional Overhead Door is balanced by a spring device and use low-power transmission to do vertical or turn lift along the wall. It only take up a little space for left and right of the door, open and close flexibly, and has safety protected devices, if it hitting obstacles when the door falling, it will stop or return to the full open state immediately. In case of any accident occurred, the door can be open manually and rapidly, to ensure that people and goods can evacuate quickly. According to user requirements, can configure automatic control device (remote control or light control), the remote control distance ≤ 50mm. The door with windproof, thermal insulation and sound insulation functions. This door is suitable for factory, workshop, and warehouse and so on. 1) Door panel is high quality double galvanized steel plate, filled with high density rigid polyurethane foam materials in the middle of the panel, and has columnar stripes on the surface of panel; after spray, high temperature baking and other process, will not only increase the aesthetic, but also improves the corrosion resistance and durability. 5) The grade of wind resistance performance is 3; water tightness: grade 3, gas tightness: grade 2, the flame resistance of door panel material reach grade B2. 7) Operating temperature: -20 ℃ ~ +60 ℃. 8) The door opener with a safety switch for small door, to ensure that if someone need to through and open the small door during the main door is operating, the main door will stop immediately. 1. Never operate the door when someone under the door, if the door is stuck, do not force breaking, and should ask someoneprofessional to repair. Prevent children from operating the door to avoid cause personal injury. ⒉Manual operation device is designed for emergency case, should not as a common open way for daily. 3. If set up a small door, to avoid damaging the door closers, it should not more than 90 degrees when open the door, before opening the door, to check whether the small door has been closed in good condition. 4. Air-sensing rebound device installed in the lower end of the door adapt to open automatically in exceptional cases, please do not touch artificially. 5. Hit the door with a hard object is strictly prohibited; do not open the control box without permission. In case of a fault, please contact us. 6. Due to product improvements, cause any changes of product appearance, performance and any other aspects, will without notice, if the instruction manual not matches with the physical goods, physical goods prevail.